I won’t lie, I love food and therefore volume food is important for me when dieting. I’m in the early stages of dieting, so I’ve still got a lot of food. However, if I hack this volume earlier, it will be helpful when I’m deeper in a deficit. You would think I’m crazy putting courgette into oats but you can barely taste it, and there’s a lot of food volume so I don’t mind. Lately, I’ve been trying to play around with peanut flour and combining with chocolate is amazing. Pour the outs in the bowl, add courgette and water. Microwave for 1 minute, add peanut flour, cocoa and milk and heat for another 2 minutes. 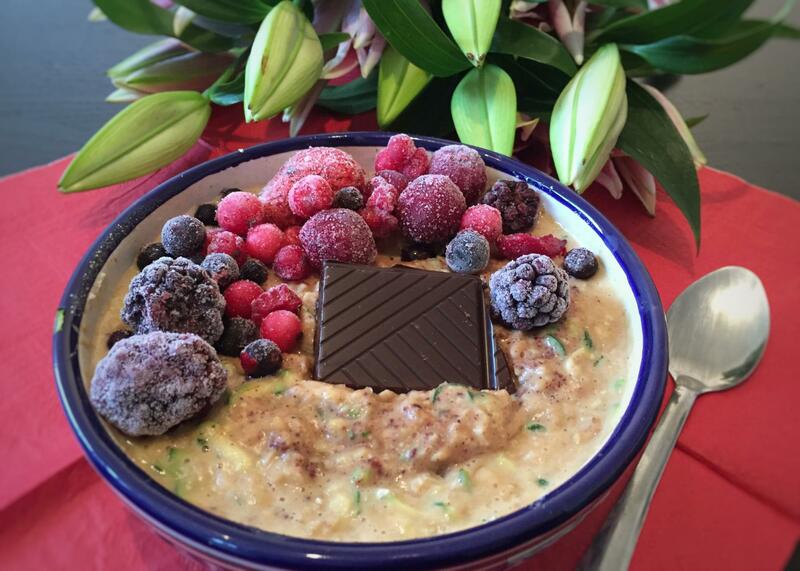 Add whey protein and sweetener if needed, decorate with fruits and chocolate and enjoy! Nom nom.